Providing unrivalled tipper/ plant hire solutions to local authorities and main contractors across the capital and beyond, Tipper Services Ltd. is a long-running family business with almost half a century of experience. Not long after he took possession of the company’s first-ever Scania, we caught up with managing director Billy Donoghue to find out more about this exceptional operation. In July of 2016, Billy Donoghue of Tipper Services Ltd. collected a beautiful 162-reg Scania P410 8x4 tipper (with Thompson tar body) from Delaney Commercials. The purchase represented a new departure for the long-established Tallaght-headquartered family business as it’s the first Scania to join their impressive fleet, which currently comprises 15 units. Regular investment in a fresh, well-maintained and robust fleet has enabled Tipper Services to establish and consolidate a reputation for delivering excellent levels of service, which has enabled them to forge strong, lasting relationships with local authorities and main contractors in and around the city. 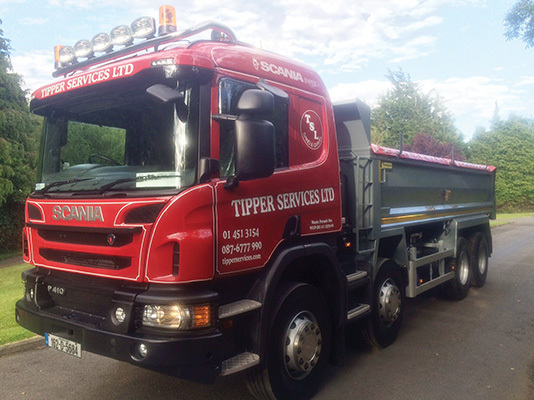 Tipper Services Ltd. boasts an outstanding track record in delivering construction materials –the fact that they have been serving Dublin City Council’s roadworks division for over 40 years speaks for itself! –and all the signs are encouraging that the future prognosis for this enduring operation are equally positive. Regarding his decision to go with Scania for the first time, Billy notes: “We used Hino for years and still run nine Hinos as well as four Volvos and a Renault. We found the Scania to be a very practical lorry for driver vision, cab height and overall practicality. From an owner’s point of view, it’s a straightforward, economical truck. The genesis of Tipper Services Ltd. dates back to the late 1960s when Billy’s parents Willie and Vera, who are originally from Mayo and Galway respectively, set the business up in Manchester. “My father bought his first truck there when he was 18 and he ran six or seven over there,”Billy explains. “He grew up on a farm in Mayo and served his time for a year or two in the local garage in Castlebar. He went up and down the M1 from quarry to quarry, starting at the sandpits in Heaton Reach. Billy is prepared to work nationwide. “We’ve hauled tar for SIAC to Cork, Galway, Drogheda, the Mullingar Bypass and Tayto Park. Wherever the work is, we will go,”he confirms. Tippers Services Ltd. is very much a family business offering a personal touch. Billy took over the reins five years ago and his sister, Yvonne, looks after the CPCs and RSA compliance. Gainful employment is generated for a team of 15 full-time staff, many of whom have given decades of service. Bookkeeper, Mary Monaghan, for example, has been part of the team since 1988. Billy believes that buying new trucks is the way to go due to the current state of the second-hand market: “The choice of four-axle tippers in the second-hand market isn’t as great as it used to be,”he observes. “It’s become very difficult to find tipper trucks that are well kept. I like to keep them tidy and fresh and I found that the money I was putting into second-hand trucks post-2006 wasn’t great because people hadn’t been spending money during the recession and you were buying someone else’s trouble. I realised that new was the way to go. “With 15 lorries, you can’t afford downtime. It’s serious now; drivers need to be moving and trucks need to be working. The Irish tipper market is very competitive and it’s also very sensitive.